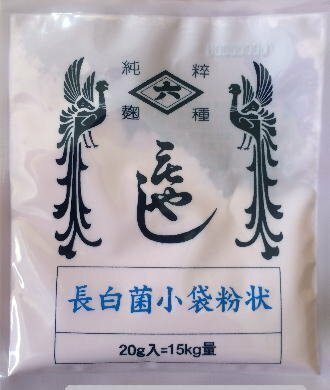 SUPER Tempeh Starter ( Contains Rhizopus Oligosporus , rice powder) 120 Gr. This tempeh starter is produced by external sources, and contains rice powder, as media, and Rhizopus Oligosporus spores, made by Cap Jago, a welknown commercial tempeh inoculum starter from Kediri, on Java. This super Tempeh Starter Kit can produce 10 kg tempeh from beans, with 1 tablespoon of starter, accordantly to the producer 120 grams could make 200 plus lbs of fresh tempeh per package. Contains NO products, and is GMO free! Cap Jago tempeh starters are designed to process beautifull standard tempeh, with lots of spores, to give it the original taste of tempeh from Middle Java, and are pure vegetarian. The Tempeh culture contains spores of Rhizopus Oligosporus, Rice powder, needed as a medium, which makes a beautifull standard Javanese tempeh, and keeps the traditional taste! Our prices and shipping are the best, this product is for the serious home tempeh maker, with high yields. It's easy to make tempeh at home at a very low cost. Soybeans are soaked overnight, cooked for about 30 min and mixed with tempeh starter. After 28 to 32 hours incubation you have delicious fresh tempeh. 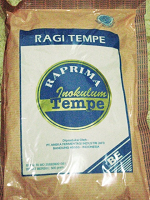 Contains: Tempeh Starter (Rhizophus Oligosporus Culture), Rice Flour. Does not contain MSG or preservatives. GMO free. This product is manufactured, and packaged in an external facility that NOT produces wheat, dairy, nut, or fish products.